Calgary, Alberta --- January 9, 2019 --- Nureva Inc., an award-winning collaboration solutions company, announces the installation of its Nureva visual collaboration solution in an innovative new customer experience center at the head offices of UNION Gruppen, a leading commercial real estate company in Norway. The technology-rich collaboration space takes up most of the fifth floor of UNION’s downtown office building located in one of Oslo’s most prestigious business districts. The triple Nureva Wall system has transformed a large wall into a 21′ (6.40 m) wide interactive workspace that is used to showcase properties to clients and facilitate collaboration between internal project teams and colleagues in other locations. To stay ahead of its competitors in Norway’s active commercial real estate market, UNION Gruppen wanted a technology solution that would streamline the process of buying, selling and leasing out properties, and provide clients with a more engaging and collaborative experience. Using the Nureva Wall and cloud-based Span Workspace, UNION clients get a complete picture of what each property has to offer. The new high-tech customer experience center brings together everything tenants, landlords and other key participants need to make decisions. Clients can access a vast array of digital information on one large interactive surface, including aerial views of a building’s location and specific details about floor plans and features. In the past, clients would view a slide presentation about a property and, if interested, would work out details through a series of follow-up meetings and emails. With the Nureva solution, the process is faster because everyone can actively participate in discussions by working together on the large interactive surface, adding notes and brainstorming ideas. Clients get a deeper and more engaging experience and feel empowered to make better and faster decisions. The company estimates that timelines for the initial phases of some projects have been reduced by 50 percent. By offering a more efficient and satisfying client experience, UNION Gruppen expects to attract more business and stand out in a highly competitive market. 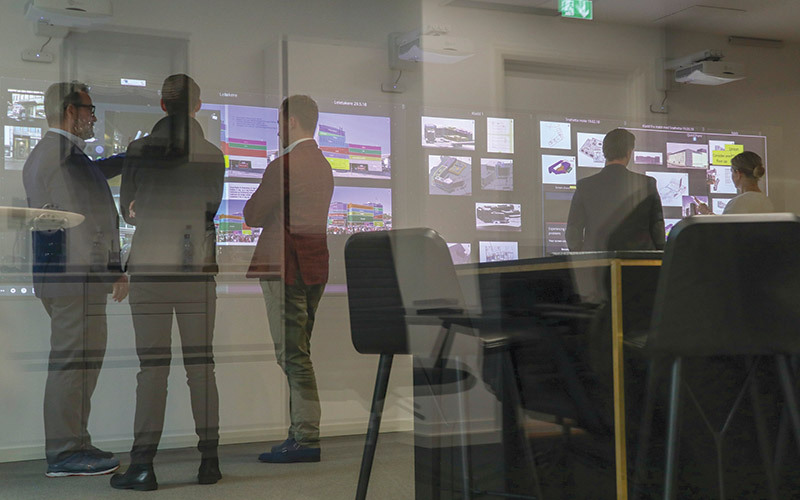 Download images of the Nureva visual collaboration solution being used at UNION Gruppen. 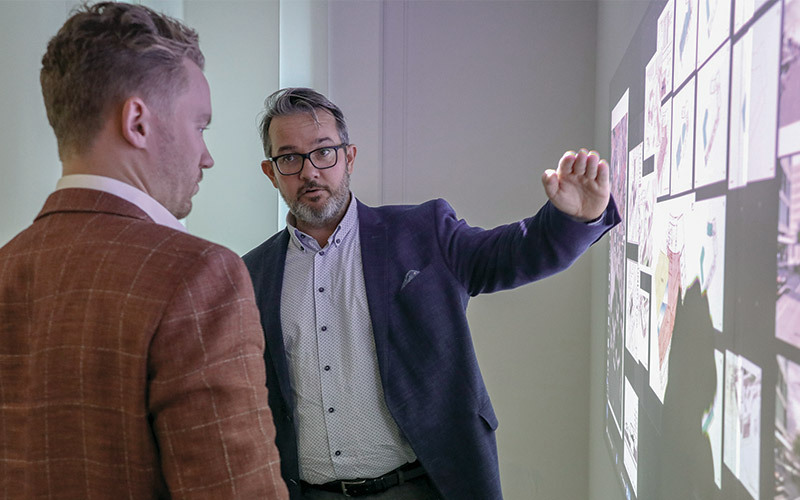 Read more about how UNION Gruppen is using the Nureva visual collaboration system to streamline processes and grow their business. The Nureva visual collaboration solution combines Span Workspace with the Nureva Wall. It is designed to support highly collaborative activities that benefit from visualizing and interacting with information on a large surface, including structured processes such as lean, agile and design thinking. Span Workspace provides an expansive cloud-based digital canvas that can be tailored to suit virtually any collaborative activity. It draws upon familiar, simple and flexible tools including sticky notes, sketches, images, templates and screen sharing. Participants contribute and interact with the content using their personal devices, whether a computer, tablet or smartphone, or directly on the Nureva Wall or other interactive display. The Nureva Wall transforms collaborative spaces by creating large, ultrawide interactive surfaces that turn walls into expansive digital workspaces with high-performance multitouch and inking capabilities. The Nureva Wall is optimized for use with Span Workspace and can incorporate users’ preferred applications, including Microsoft® Office, Adobe® products and AutoCAD® software. For more information, visit the visual collaboration section on the Nureva website. UNION Gruppen is an independent, leading player in the Norwegian market for commercial property. The services the company offers relate to investment, management, commercial property agency and research. UNION Gruppen has been creating value from property for more than 30 years. Established in 1984, as one of the first specialized commercial property agents in Norway, its group of companies now ranks among the country’s most complete providers of property agency, consultancy and investments products. To learn more, visit the UNION Gruppen website. Nureva Inc. is a multiple award-winning private company that imagines and builds solutions for tapping the creative and problem-solving potential of diverse teams around the globe. For businesses, that means enabling the group creative processes that are used to solve problems and develop breakthrough ideas that drive organizational advantage. In education, it means enabling the student-led, collaborative activities that deepen learning and equip students with the skills required for future success. A passion for deep customer understanding and a commitment to innovation drive the company’s product roadmap. For more information, visit Nureva’s website.